I started reading F&SF late in the 1970s and I’ve had a subscription on-and-off since then. When I haven’t had a subscription, I buy the occasional issue to catch up on the style of fiction I’ve come to expect from the magazine – what the genre calls “literary speculative fiction”. Practitioners of this (who just happen to have been published in this magazine) are people like James Morrow, Thomas Disch, Daniel Keyes, Kate Wilhelm, Eleanor Arnason, Gene Wolfe and many others. For the most part, their fiction has sought to explore issues using the genre with the tools of social commentary. It’s what I expect of the magazine. First of all, I was thrilled to discover that nothing has changed at F&SF! The magazine is still packed with fascinating stories and features – and it is those features I’ll start with. The book reviews were well written overall, but Charles de Lint did something unexpected – he used his review as a teaching opportunity. As a writer and sometime submitter to F&SF, I appreciate the easy grace with which he both reviewed the books and passed on some of the wisdom he’s gleaned. In this age of multi-volume, endless series (a half dozen LEAP to mind), he points out, “…instead of being able to follow the further adventures of whatever sort of character tickles your fancy, the writers are giving us complicated story arcs that play out over a number of books...which makes it daunting to the newcomer who isn’t a part of ‘the club’.” This set his review above the others. Paul Di Filippo’s “Plumage from Pegasus” was a delightful romp as well. 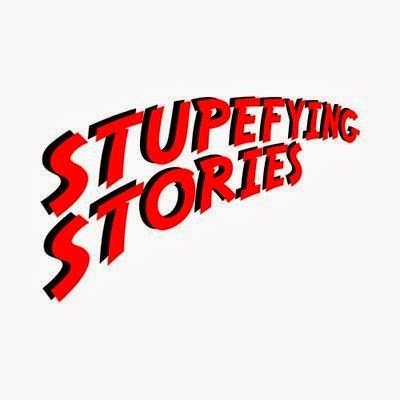 Movies are reviewed competently, Curiosities are entertained, and the Science column was grossly fascinating – and provided me with a story idea! I should point out right now that I am extremely choosy in what fantasy I read. It must come with a powerful recommendation in order for me to crack the cover of your average fantasy novel. As a junior high and high school science teacher for the past 32 years, my heart and interest lean strongly toward the sciences and science fiction. That being said, I’ll dive into the stories in this issue starting with the ones that didn’t strike home in the target of my particular heart and ending with the ones that I will likely keep in mind for some time to come. I found that the weakest story in the issue was also the longest. “In the Mountains of Frozen Fire” by Rus Wornom, takes a trip into the past and tries to put a new spin on an old genre – perhaps best illustrated by the fourth Indiana Jones movie, “Kingdom of the Crystal Skull”. This story had the same effect on me that the fourth Indie movie did: while it tried very hard to recreate the sense and rhythm of “Raiders of the Lost Ark”, it ended up being derivative and tedious and I found myself wishing a couple more short stories occupied the forty-four pages this story took up. Next was “Half a Conversation...” by Oliver Buckram. It left me scratching my head and trying to figure out if the other half would have made the story better or worse. In “Kormak the Lucky”, by Eleanor Arnason (an author local to me), I found a quiet tale – like an instructive fairytale – well told but not as exceptional as other stories she’s written. It’s nice – but not memorable – except for the enchanted train connecting the world of the fey and the real world. That was a nice touch. “The Nambu Egg” was competent and almost cute, but was extremely talky – in a bad way. While I was never drawn into author Tim Sullivan’s imagination and I had trouble suspending my disbelief, what I found to be the biggest barrier to entering the story was that the character Adam Narya never really faced an obstacle to his mission. The denoument was too easy. “Oh Give Me a Home” had the feel of an O. Henry, not so much in length as in setting. William Sydney Porter loved the old west and that kind of love brought this story by Adam Rakunas to life. Where I was unable to “be in” the Mountains of Frozen Fire, here I had no trouble being in some undefined place on the Great Plains and living this story. Science fiction in methodology, it serves its literary master by being about family, relationships, and frustrated hope. The title – as I’ve come to expect in litspecfic – had multiple meanings and contributed to my delight in this tale. Ken Altabef evoked a deep sense of sadness in me while introducing me to a world I knew nothing about – Inuit mythology. I loved that part and while I never really found myself carried away by “The Woman Who Married the Snow”, it left me with a melancholy that says it tweaked me and left behind a bittersweet memory. 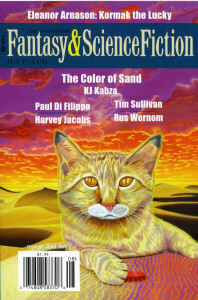 The cover story by KJ Kabza, “The Color of Sand” rose to the top of my list and had to do battle with my first and second favorite stories. The concept is fascinating, the world it creates real, and the conundrum that faces Fairday, her son Catch and the sandcat Bone reaches from fantasy into reality, asking “How far is a parent willing to go to change the future of a child who makes a mistake?” When her son makes a terrible mistake, his mother goes – literally in this fantasy – to the end of the world to rectify it. Guided by their personal counselor, Bone, mother and son do what is necessary to “fix” the mistake. When all seems set and done the mistake is undone far beyond Fairday’s simple wish – and something else entirely new and unexpected comes out of the affair bringing about unforeseen changes. This is exactly what the very best fantasy should do – and what is DOES do here. I do not often stumble across writing that spears its way into my heart – no pun intended – but “The Heartsmith’s Daughters” does exactly that. I have a daughter, a foster daughter, a daughter-in-law, and a granddaughter and I could not help but see each of them in Harry R. Campion’s story. I refuse to tell you who I saw where, suffice it to say that these daughters of mine are strong-willed women who never flinch from what the world brings them. In this story, Ironheart, Brassheart, and Goldheart do not flinch, either. Their only flaw is naiveté and that is sadly rectified when Goldheart must become Stoneheart. From that point on, the daughters grow in their humanity, the narrative deftly and cleanly drawing me into a sad reflection on the necessity of such a transformation in order for women to survive in today’s world. I loved this story and it will, sad to say, haunt me for some time to come. My favorite piece in this issue was “Year of the Rat”. Chen Qiufan clearly knows the setting as with the same spare strokes an artisan uses to craft Chinese logographs, he creates a living, breathing world. This is far, far more than a simple science fiction story of a dystopian future dominated by a technologically advanced China. It is, at its heart, a story of friendship sacrificed for personal advance; it is a cautionary tale that warns gently that if we focus our vision too narrowly, we will miss the broader impact of science as it trickles into the lives regular people. This is, as I have come to expect from F&SF, literary speculative fiction at its very best as it deals with important issues with grace and elan. I think "Year of the Rat" and “The Heartsmith’s Daughters” will be on more than my personal shortlist for awards this year. WORST POWER OUTAGE IN MINNESOTA HISTORY! A New Story Up At PERIHELION!